It was warm enough for a walk on the beach today. It seemed strange to have such warm weather in November, and also strange to walk just one dog, because up until Monday night, we had two dogs. Now we are all trying to distract and amuse our remaining dog, who has lost her constant companion. In the wet sand were marks made by people, dogs, and birds. But right at the water's edge, the shallow waves were making beautiful patterns in the sand, patterns that appear, vanish, and then repeat, seeming to be constantly changing but yet always the same. Yesterday I managed to get over to Red Brick Studios. I spent an hour working on the last of my transformational landscapes. These are nine small drawings in conte crayon and pencil. They are transformed because they are drawn on nine pieces of an acrylic painting that I started several years ago, but never finished. I am glad I was able to get all nine drawings done because this weekend is Open Studios at Red Brick. This is the portrait I am painting for my friends, as it looks today. Yesterday I worked on the jacket and shirt. I changed the shape of the shirt collar. Then I worked on the jacket, adding layers of color, and revised the line of the shoulder. This is not yet finished. I am planning to change the hair to make it look a bit fuller. Recently, it has been difficult to get over to Red Brick Studios to paint, but I did get a little time in over the weekend. 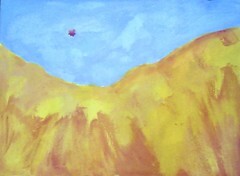 I used it to work on one of my transformational landscapes. (I cut an unfinished acrylic painting I had started into nine pieces, six by nine inches each, and drew a small landscape on each one with conte crayon and a little bit of pencil. I used the random composition of the cut-up painting to suggest the composition of each of these little landscapes.) At this point, I have done eight out of the nine drawings, and I hope to finish the last one before Red Brick's Open Studios this weekend. My Clie handheld stopped functioning several weeks ago and I really missed having the paint program (not to mention missing all my appointments!) 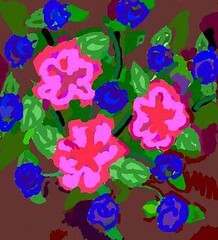 But I now have Mel's old handheld, but with a new paint program called Pocket Artist. Yesterday I couldn't get to Red Brick to paint, so I decided to try it out. Although there is much to learn and get used to, Pocket Artist has even more functions than my old handheld program had, and transfers files more easily too. Anyway, this image began as a little sketch of three flowers. I just kept going, and here is the result. 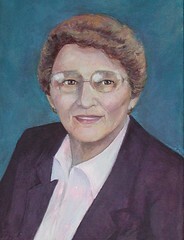 I have been painting this portrait for my friends, and here is how it looks today. Yesterday I worked on the hair, suggesting some waves, and adjusted the hairline and face shape yet again. I made some tiny changes in the eyes to make them appear more symmetrical, and I softened the jawline just a bit. Then I reworked an area of the background that I had re-painted. These are all small changes, in fact, most less than a sixteenth of an inch of difference. But small changes add up in a portrait. I hope to be able to mail this to my friends this week. 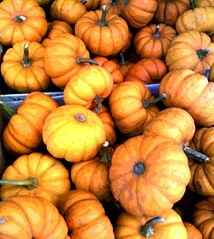 This image began as a photo that I took this fall at a farmstand, using my phonecam. I loved the patterns of these little pumpkins, so I took a picture. Thinking about Thanksgiving reminded me that I had this photo. So tonight I cropped the photo, then opened it in Painter IX to clean up some distracting marks on the pumpkins with digital pastel. Then I had the idea to try to posterize the image. I liked the way it looked posterized, so I saved it and here it is. This is a painting I started tonight at the second session of the oil bar class I am taking at Red Brick. The assignment was to do a landscape. 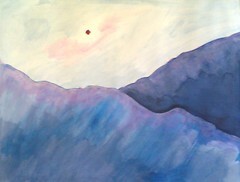 This is from my imagination and memories of the mountains in Colorado. Since last week's class, my oil bars arrived in the mail, but my colors are still pretty limited and I was trying to figure out how to make the colors I want. 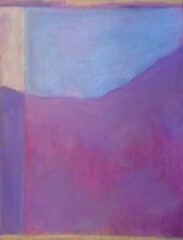 (I couldn't seem to mix a purple, but in the end, discovered I had created some purple tones by accident on the canvas.) The instructor had some very helpful suggestions about the composition. It was a lot a fun to work on this, and I will work on it some more in class next week. In my spare time, which does not exist at the moment, I am trying to get ready for Open Studios at Red Brick, which takes place in two weeks. I plan to display some of my jewelry as well as my paintings. I make pendants from found objects. 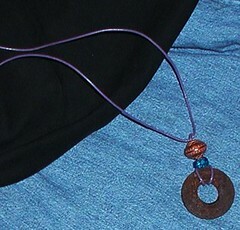 The other day, I noticed a photo in my digital camera of one such necklace. I had been trying experimenting with photographing jewelry. (Even though jewelry will generally hold still for you, taking pictures of jewelry is harder than it looks.) Tonight I transferred the image to my computer. I adjusted the contrast and decided to crop the photo, and here it is. 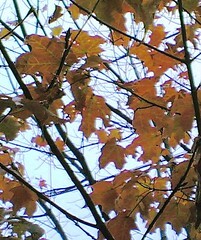 Here is another picture of brilliant autumn leaves. Recent wind and rainstorms have taken most of the leaves off of the trees. 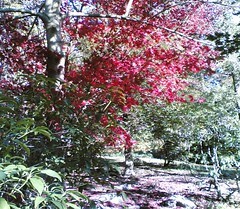 This is photo I took a few weeks ago at Long Hill Gardens, using my phonecam. Tonight I cropped the image just a bit to get the composition I wanted. Here's another picture that I took with my phonecam, a little over a month ago. I am always sad as the last of the autumn leaves fall because they are so beautiful. But when the leaves are gone, you can see the beautiful lines of the tree branches. This is the portrait I am painting for my friends. Today I made the face just a bit wider and moved the hair off the forehead. I modified the nose a bit and then made some tiny changes around the mouth and eyes for a warmer expression. 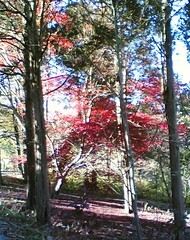 I took this photo at Long Hill Gardens about a week ago with my phonecam. Most of the trees have lost their leaves, but I was surprised to see this little red tree (a Japanese maple I think) in a wooded area. I was interested in the bright color contrasting with the bare branches of the other trees. It made me smile, so I took a picture. 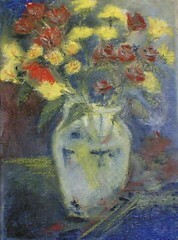 I painted this still life last night. It was the first session of a class on painting with oil bars, and my first experience using oil bars. Last night I only had red, yellow, and blue oil bars (plus black and white). Working with new materials or an unfamiliar palette creates challenges and makes you grow, even if (especially because) it takes you out of your comfort zone. I was certainly struggling last night, but I learned a lot and am looking forward to the next class. 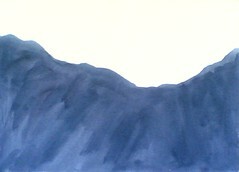 Here is the mountain landscape I have been working on recently, as it looked after I worked on it for the second time. 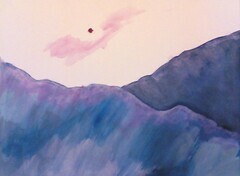 I added more pink to the sky and some darker color to the lower part of the mountains. There are a few things I would like to change, but I think this one is almost done. 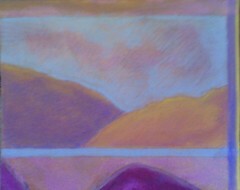 Here is another work in progress, a mountain landscape as it looked on the first day I worked on it. 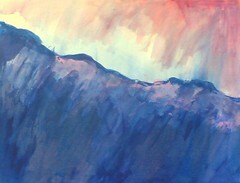 This is acrylic paint used as watermedia on watercolor paper. 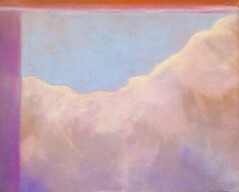 These paintings are from my imagination, but are based on memories of the Colorado Rocky Mountains. To be continued. . .
We had great weather today, and my daughter suggested a walk on the beach at Lynch Park. When we got there, the tide was too high to leave much room for walking on the beach itself, but we could look down at the water from the park. 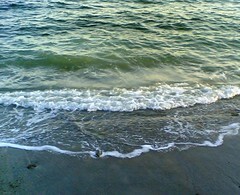 I love the way the ocean looks as the waves reach the sand so I started taking pictures with my phonecam. I think this image is the best of those I took today, so tonight I cropped it to get the composition I was after. This collage is a work in progress. I started it this morning at Red Brick, but I have been thinking about this since last week, when my daughter gave me some great paper, red on one side and orange on the other. 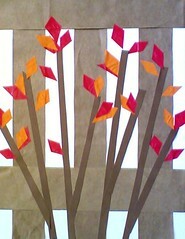 The minute I saw the paper, I decided to make a collage based the red leaves on the blueberry bush by the deck. 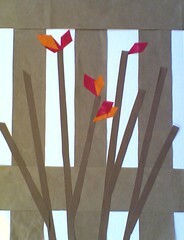 Today I created the basic composition using grocery sack paper and brown art paper for the stems, pasted on watercolor paper. It took the better part of the hour that I had just to get that much done, but I couldn't resist putting a few leaves in place to see how they would look. I had a lot of fun with this and am eager to go back and work on this some more. . . 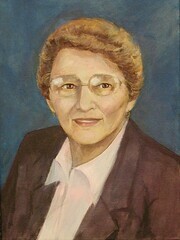 Here is the portrait I am painting for my friends. Today I made several very small changes to the face to make sure the features are all aligned correctly. Then I concentrated on the mouth, working on lip shape and color, and trying to create a softer look. I put a dark wash over the jacket to even out the color, and sketched in earrings. There are still a few things I would like to modify, but even so I hope to be able to send this to my friends within the next week or two. Today I went back to Red Brick and photographed two of the paintings I worked on yesterday. By this time both paintings had dried and were reasonably flat, so I was able to get better photos. Here is one of the paintings I worked on yesterday. I added more neutral shadow to both mountains, and added color to the sky. This is either finished or very close to it. I went to Red Brick today and worked a little on two paintings that are already in progress. They were still too wet to photograph well by the time I had to leave, so I will try to go back and get better photos in the next few days. But I also started a new painting today, a small landscape, and here it is. Here is another of the watermedia landscapes I have been working on, drawing on my memories of the Colorado Rocky Mountains. 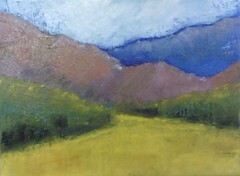 Last week at Red Brick, I went back to this landscape and added some dark purple to the more distant mountain. I added contrast because I was afraid that the original line that began this painting would get lost. Right now, the contrast is a little too stark, but I will work on that problem later this week. This is still a work in progress. To be continued. 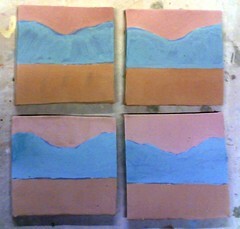 . .
Last week, at Red Brick, I saw that the tile coasters (painted for the upcoming fundraiser) have been fired. Here is a picture of mine. The color of the mountains came out midnight blue, almost black. 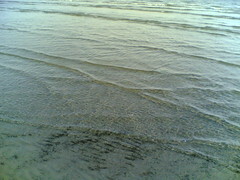 (In fact, when I took pictures with my phonecam, I thought there was something wrong with the image and tried to fix it!) But the problem was not the photo, but my expectations! 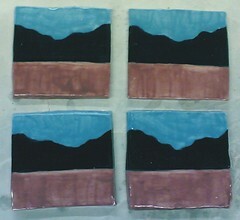 The glaze was much lighter before the tiles were fired and at first, I was disappointed because these don't look the way I expected they would. But life, like art, is full of surprises. At this point, I like this color scheme. It reminds me of the way the mountains look as the setting sun moves behind the front range, lighting up the evening sky and leaving the mountains in shadow. Today I worked on the portrait I am painting for my friends, and here is how it looks right now. I worked on softening the eyes, making them look more relaxed. I also made a lot of small adjustments to the mouth. I am still considering a number of other revisions, but I had to stop for the day. But before I packed up the paints, I put a gray wash over the blue background and the purple jacket, to make the color a little darker and to provide more depth. Sometimes the practical demands of life make it hard to take time out to make art. It has been a busy week, but for me, everything else goes much better if I take a little time to draw or paint. Yesterday I went to Red Brick even though I could only stay a short time. I decided to work on one of my small drawings in pencil and conte crayon. I call them transformation drawings because I cut up an old painting I started for a painting class into nine small landscapes. This project was a good choice because there is no cleanup or prep for conte crayon, and no drying time. And because the drawings are small, I was able do something quickly. I had fun, fell right into the drawing, and felt great afterwards. The rest of the day went much better! Here is my drawing. Here is the latest version of this little painting. Yesterday I added some color to the sky. 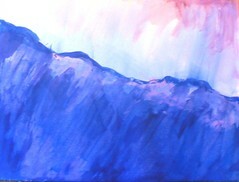 I chose blue and purple tones to complement the yellow and orange colors in the mountain. To be continued. . .